I believe that the man who observes self-control in thought, word and deed, right in the midst of the world, is verily the true ascetic. If things do not bind us and if we are not attached to things even when they are easily available to us that according to me is the greatest test of our detachment than merely withdrawing to a lonely forest. 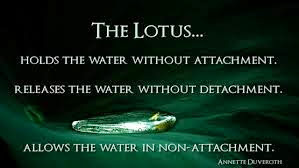 Love is an attachment to another self. Humor is a form of self-detachment — a way of looking at one’s existence, one’s misfortune, or one’s discomfort. If you really love, if you really know how to laugh, the result is the same: you forget yourself. 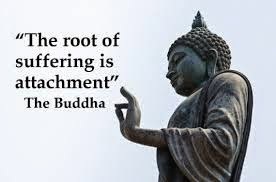 Detachment means to remove one’s mind from all sorts of desires. As the mind is removed from desires, the energy that was being destroyed in running after these desires is saved and it becomes a flame. Living in solitude, eating lightly, controlling the thought, word, and deed; ever absorbed in yoga of meditation, and taking refuge in detachment.